Alex Toth-Jones Racing | Alex signs with Richardson Racing for a 3rd year. Alex signs with Richardson Racing for a 3rd year. Richardson Racing can today confirm that it has re-signed Alex Toth-Jones for the 2018 Protyre Motorsport Ginetta GT5 Challenge season. Alex will be part of a new look line-up for the Corby-based team – which announced the signing of series rookie Charlie Martin last month. Bradford racer Alex showed his pace on track throughout the 2017 season with a number of top ten results, and came close to a maiden podium in the highly competitive one-make series. Confirming his place on the grid for the new campaign, Alex will put his past experience in the series to challenge regularly towards the front of the field across 17 race schedule that includes 2 meetings alongside the British Touring Car Championship and an overseas meeting at the famous Spa circuit in Belgium. 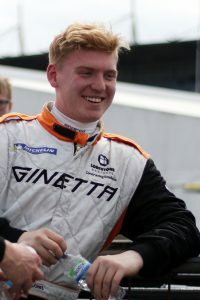 Alex’s return to the championship has been made possible thanks to the continued support of existing sponsors Lodestone Projects and Proceed Group, as well as new headline sponsor Tailored Resourcing & Accountancy; which offers a range of cost effective services to contractors, freelancers and small business owners. Aston Martin Racing announce Alex has been chosen as one of the AMR Driver Academy drivers. Knockhill fighting the Scottish weather! You all Helped fix Bert Goose!